Clearly hubs was getting hungry, because he was already on his phone looking stuff up before the episode ended. Once the credits were rolling, he suggested we head over to Mike’s (All Seas Fisheries) to see what they had. 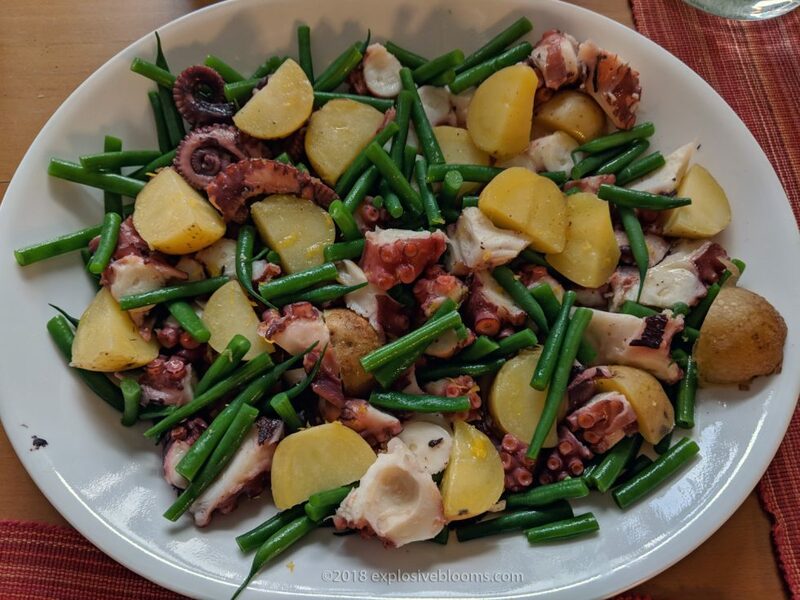 My introduction to octopus salad was in 2014, when we were cycling in Croatia. The salad was simple, but so fresh and delicious and like nothing I’ve had here in Toronto. The next time I had the opportunity to eat this dish again was inBrindisi, Italy (modified with canned tuna and lettuce) and Sorrento, Italy (2016). The final times I’ve had it, and am still delighted by it, was in San Sebastian, Spain and Sevilla, Spain (Galician style) (2017). Here in Toronto, octopus usually comes grilled. This isn’t to say it isn’t delicious, but there’s something wonderfully light yet hearty when the octopus is presented in this non-grilled form. 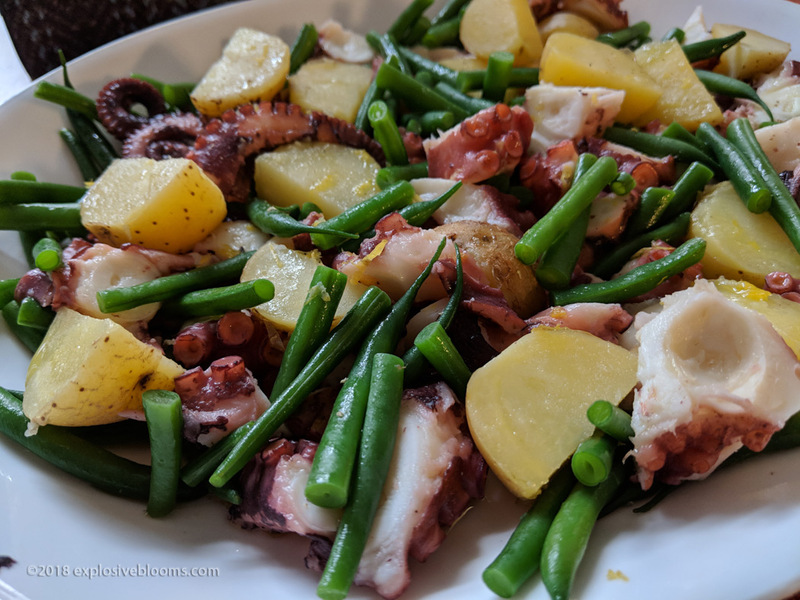 The octopus is braised and cut into rounds, often served with potatoes, sometimes with tomatoes, sometimes with some lettuce, drizzled with olive oil and lemon juice. 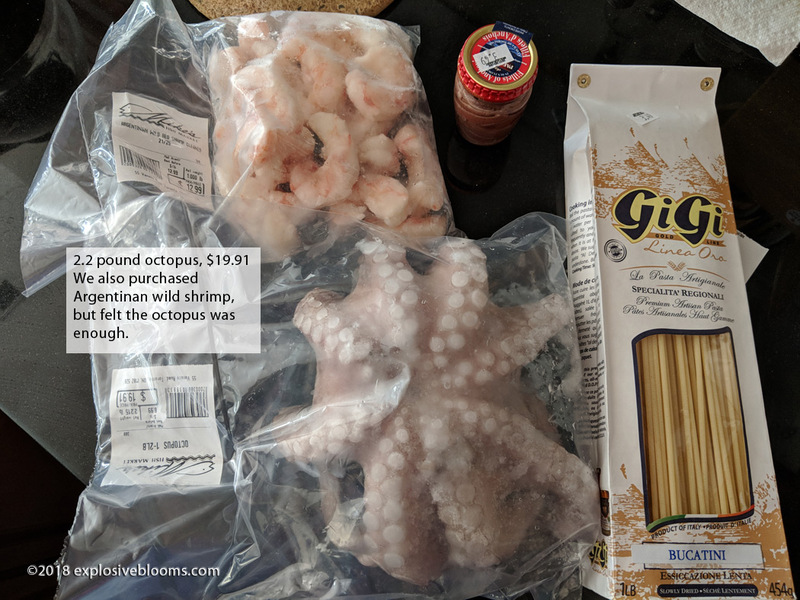 When we got to Mike’s, we found whole frozen octopus, so we picked up a 2.2 pound bag. The thought of the battered and fried misto plate led us to pick up the bag of wild shrimp from Argentina. At the fish counter, we also saw smelt, but hubs was worried that even after deep frying, the bones would be annoying (Stefano said that once deep fried, you can eat the whole thing, but this is not hubs’ experience). They didn’t have the regular smoked mackerel, so we opted for a jar of anchovies. I picked up the bucatini, just because. 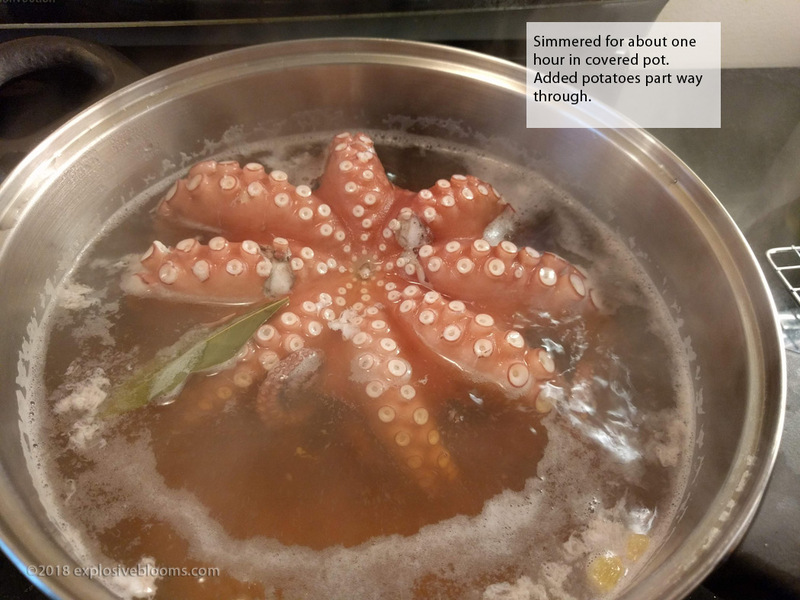 We thawed the octopus in a bowl of water, before braising it in a pot of seasoned water. 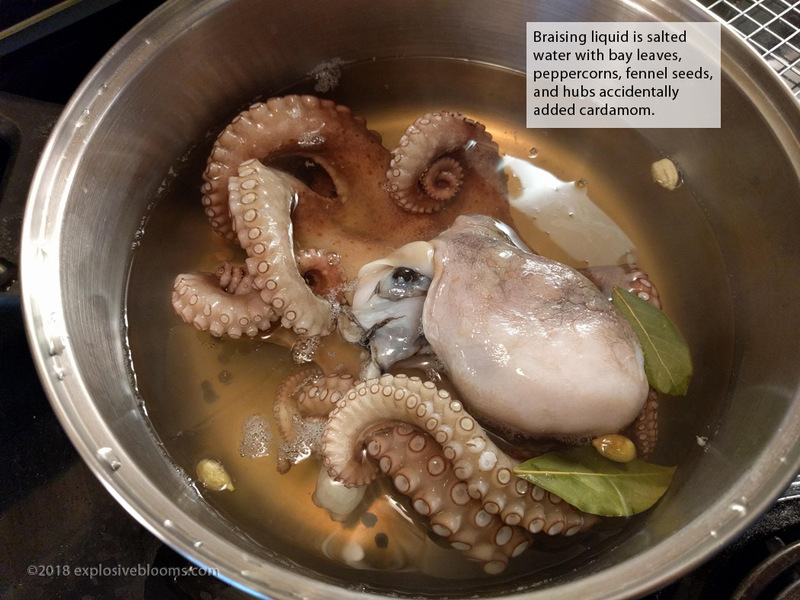 Stefano braised his octopus in wine, but hubs felt this was a waste of wine – trust me, it still tasted wonderful. You need to braise it for a while so that the meat gets tender – we let it simmer for an hour. In the same pot of water, we boiled some baby potatoes. I had some green beans left, which I felt would be a good addition. Once the octopus came out of the pot, hubs cut it up into manageable pieces. Be generous with the EVOO and salt. I grated some lemon zest, and squeezed the juice of half a lemon. The lemon adds a bright finish. Meanwhile, hubs made a simple pasta dish with garlic, anchovies, cherry tomatoes, and olives. It was garlicky, but we’re garlicky together so it’s alright. We also had some buffalo mozzarella, so why not have it with the tomatoes? This was an amazing meal, and more food than we could finish. 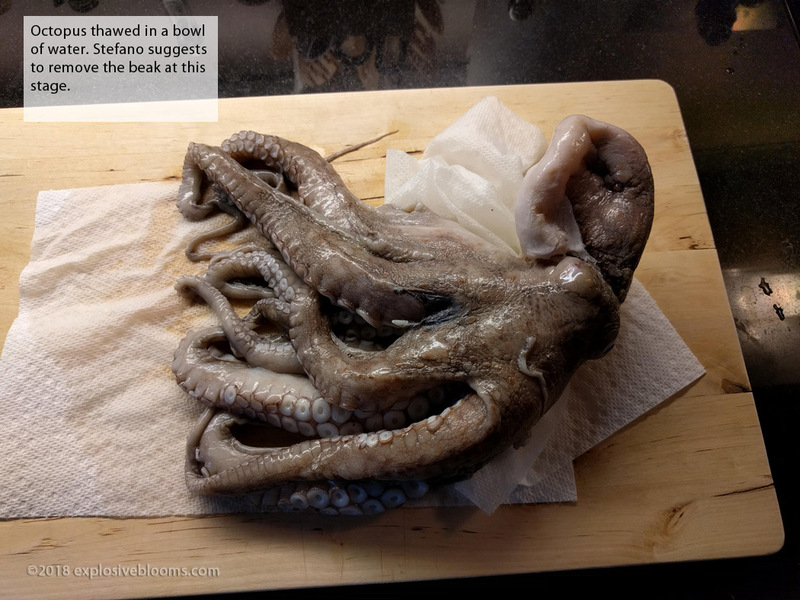 There’s still a few pieces of octopus left to snack on. Good thing we held off on cooking the shrimp. I’m pretty sure that lingering aroma of garlic is coming from me. 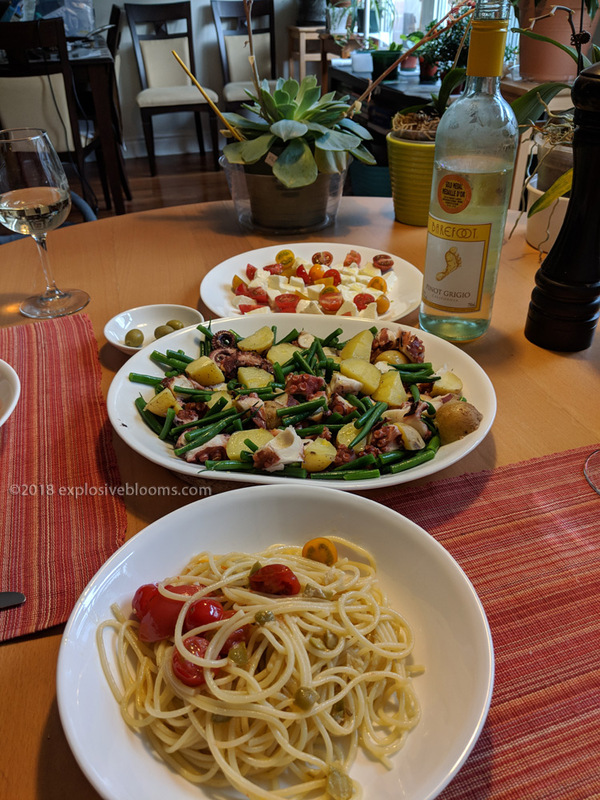 As our first attempt at cooking octopus, I think it turned out very well! I wonder if the octopus can be pressure cooked? Here are two recipes to get you started: Serious Eats (Galician style) and Savory Nothings (summery with orange wedges). After dinner we decided to go for a stroll. Sometimes we stroll, sometimes we hop on our bikes for a quick spin around the block, but I was feeling the wine and didn’t think riding was a wise decision. The air was filled with a sweet scent, so when I saw trees with clusters of white flowers, I stuck my nose right up to the flowers. The heavenly fragrance filled my nostrils – it reminded me of blueberry jasmine. 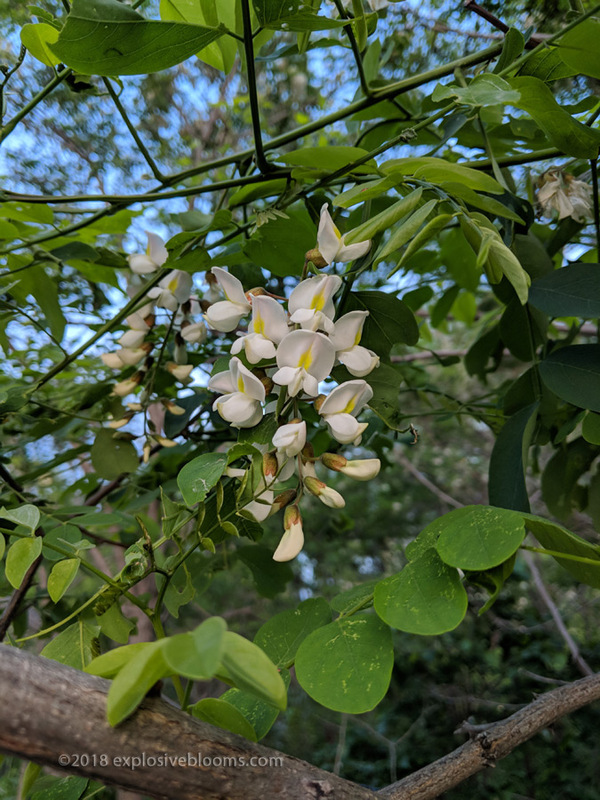 Turns out these are black locust trees. I hope they stay in bloom for a while longer as I love the scent, but too bad they are considered an invasive.